Adobe revealed a critical zero day flaw in Adobe Flash--the second in less than a week. 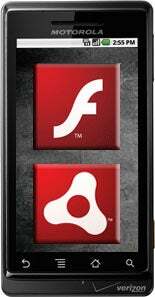 The vulnerability extends even to Adobe Flash on the Android mobile OS, supporting at least one of the reasons laid out by Steve Jobs for not allowing Flash on the iPhone and iPad. An Adobe spokesperson contacted me and shared that, "A critical vulnerability exists in Adobe Flash Player 10.1.82.76 and earlier versions for Windows, Macintosh, Linux, Solaris and Android operating systems. This vulnerability also affects Adobe Reader 9.3.4 for Windows, Macintosh and UNIX, and Adobe Acrobat 9.3.4 and earlier versions for Windows and Macintosh." In a nutshell, the critical flaw could be exploited to crash the affected system, or may even allow an attacker to gain access and control it to execute additional malicious software. There are reports that this vulnerability is being actively exploited in the wild against Adobe Flash Player, but Adobe is not aware of any attacks exploiting it against Adobe Reader or Acrobat thus far. The Adobe spokesperson explained, "Adobe is actively sharing information about this vulnerability (and vulnerabilities in general) with partners in the security community to enable them to quickly develop detection and quarantine methods to protect users until a patch is available. As always, Adobe recommends that users follow security best practices by keeping their anti-malware software and definitions up to date." Those best practices are long established among the traditional desktop computing platforms, but users running Adobe Flash on Android smartphones may be left wondering exactly which "best practices" will protect them. Smartphones have grown into palm-based portable computers--with processing power and storage space significant enough to be a worthy target--but smartphone security is not as evolved as its desktop and notebook counterparts. As Microsoft has improved its software development processes and implemented new security controls in the Windows operating system and other applications, attackers have looked elsewhere to find the chinks in the armor. Adobe has emerged as the virtually ubiquitous low-hanging fruit--with security practices that are not as mature as Microsoft's, and software with potentially exploitable weaknesses available on pretty much every platform out there. The iPhone and iPad stand uniquely apart from other smartphone and tablet platforms thanks to Apple's very public rejection of Adobe Flash for iOS. While the real reasons probably have more to do with iAd and wanting to exert tighter control over the developer community, security is also a concern that has been cited. Zero day flaws like this one, which potentially impact Android smartphones running Adobe Flash, seem to illustrate the wisdom of that choice. The Adobe security advisory states, "We are in the process of finalizing a fix for the issue and expect to provide an update for Adobe Flash Player for Windows, Macintosh, Linux, Solaris, and Android operating systems during the week of September 27, 2010. We expect to provide updates for Adobe Reader 9.3.4 for Windows, Macintosh and UNIX, and Adobe Acrobat 9.3.4 for Windows and Macintosh during the week of October 4, 2010."